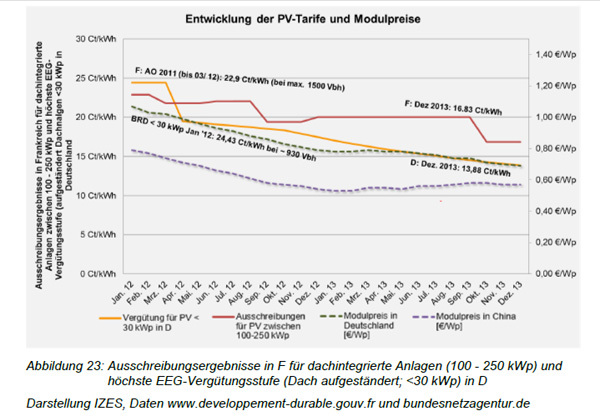 IZES, says Morris, found that the price of of PV in Germany was €0.14/kWh and in France €0.17/kWh at the end of the period. This is a clear refutation of the main argument for auctions that they lower prices relative to feed-in tariffs. According to the report, what auctions do do well is limit who can build and own renewable energy and limit how much gets built and when it gets built. Actual outcomes of auctions in France, Brazil, and the Netherlands by Craig Morris. Bewertung von Ausschreibungsverfahren als Finanzierungsmodell für Anlagen erneuerbarer Energienutzung by IZES.